The following is a submission by guest author Chris O’Connor for CIMSEC’s Distributed Lethality week. 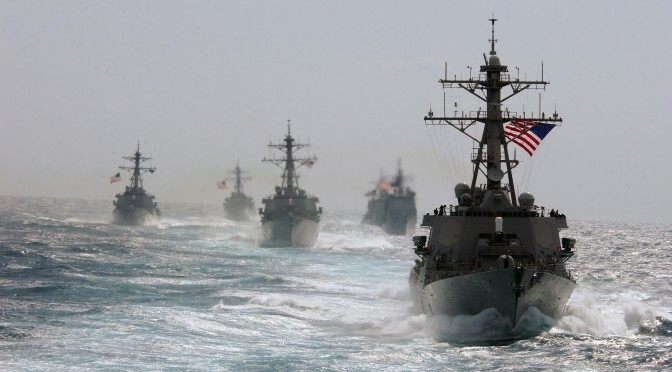 Distributed lethality is a concept that harkens back to the glory days of the US Navy in the age of sail: small groups of ships with operational autonomy fighting the enemy with their organic firepower and capabilities. Operational autonomy was the default state for ships until Marconi’s radio set- the lack of instantaneous communication meant that commanders had to make decisions by themselves. Concerning distributed lethality, the lack of communications is imposed upon our ships by enemy communications denial in an A2/AD environment. The parallel does not work in the logistics domain as well- warships then had to fend for themselves logistically, while today, we will have to force a new mode of supply on our ships in order for them to operate independently. There are some lessons we can learn from how we supported our ships in the past, but there is a big difference in the sustainment modality of the 64-gun USS Bonhomme Richard of Revolutionary War legend and the modern namesake of her captain USS John Paul Jones (DDG-53). First of all, those ships of sail operated with what is now called an “expeditionary mindset.” They operated with austerity, for replenishment opportunities were few and far between. Most of our surface combatants are replenished from MSC ships with such frequency that fresh fruits and vegetables are a part of the staple on Carrier Strike Group (CSG) deployers and hard pack ice cream is not uncommon. Life on-board the hunter killer Surface Action Groups (SAGs) will be less comfortable, but it does not have to regress to the days of hard tack and picked herring. Instead, austere life on a modern surface ship life will be closer to that of how submariners live on nuclear attack subs. More canned and from scratch food could be served and valuable storeroom space that is now used for ship’s store items and soda vending could further extend the endurance of a vessel as food storage. Our refrigeration units could be converted to only carry frozen items, yet another adaptation for better food autonomy that sacrifices the comfort of salads and perishable fruit for several more days between replenishment hits. 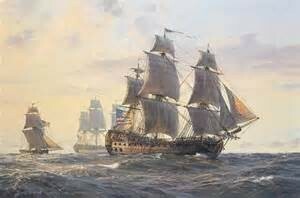 Ships in the age of sail had carpenters in their crew and bosun’s mates that could repair a large part of what we would call ‘Hull, Mechanical, and Electrical’ systems on today’s warships, using materials that could be collected from almost any port- or from captured enemy ships, for that matter. Shot out rudders, rigging, sails- the prime movers of a ship of the day- could be at least “jury rigged” with organic capabilities on-board. The bridge that modern warships need to come even close to this capability is a suite of additive manufacturing systems that can build replacement parts of many shapes and materials, to include systems that can repair parts by building directly on their surfaces with an additive manufacturing (AM) system. Sailors will need to be able to repair their own systems with these new technologies, introducing an organizational level repair suite that can fix far more than the currently installed machine shops. In the near term, AM will not be the solution to all of our shipboard repair problems, especially on space constrained surface combatants. The state of the technology means that our ships will still depend on logistics assets for at least some of their repair parts, which will tend towards the complex in design, and will be most likely vital for the operation of our critical systems. The delivery of high priority parts to ships at sea necessitates a solution that departs from our historical parallels. If we are to provide logistical supports to distributed assets in a emission-restricted or denied environment, a family of autonomous replenishment assets needs to be developed. In the “distributed lethality” environment, large, exquisite MH-60 helicopters should not be used to deliver small packages of critical parts (a situation that the author has personally experienced a number of times). These multi-mission aircraft are better utilized prosecuting targets, providing ISR, and acting as communications relays. The crews of the helicopters should also not be put to risk delivering parts where detection in contested airspace would have a fatal outcome. Vertical take-off and landing UAVs (VTUAV) lend themselves perfectly to this mission, but there is not currently a platform in the Navy that is suited for this mission. operate these systems without flight following; controlled assets are no use to us an environment where communications are not guaranteed. To enable this, such a robotic replenishment asset would have to have “sense and avoid” systems so that they do not collide with other aircraft, ships, or oil platforms as they fly point to point from ship to ship or ship to shore. In addition, these aircraft will have systems that use a combination of EO/IR, LIDAR, and INS to first get in the vicinity of the receiving ship and then land on it without any outside input or control. This is an important difference from our current CONOPs, for there is no UAV that can land on any ship in our inventory by itself; they all require UCARs (UAV Common Automatic Recovery System), SPN radars, or man-in-the-loop input. To be truly useful, logistics missions should be able to be flown to and from any surface ship, as they are with manned helicopters. 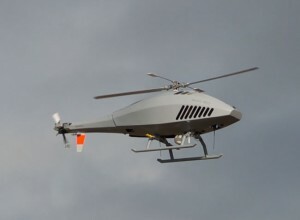 The all of the above technologies needed for an autonomous logistics UAV currently exist but have not been combined into one dedicated platform. When proven, a family of systems ranging from Fire Scout to optionally manned H-60s to hybrid airships could be employed, stretching a flexible sustainment chain that can leapfrog from asset to asset out to our hunter killer SAGs. Austerity, additive manufacturing, and robotic replenishment can only take sustainment endurance so far without dealing with the five hundred pound gorilla of energy supply. 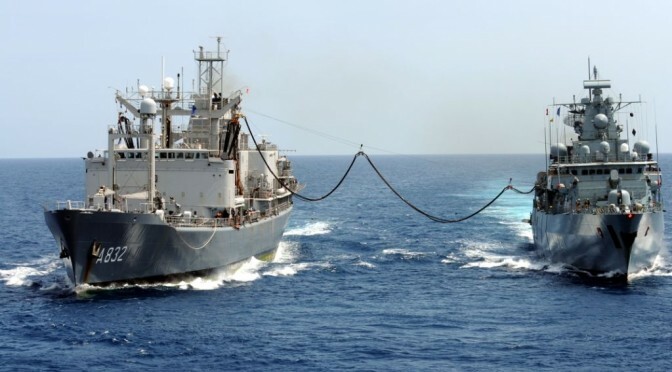 At sea fuel replenishment will be much rarer if combatant ships operate in environments that make MSC ship operations difficult due to distance or enemy threats. In addition, these oilers might be occupied in other future missions as missile shooters with bolt-on launchers or adaptive force package elements. To start, a greater tolerance for lower levels of shipboard fuel bunkerage needs to be embraced operationally. Fuel cells and batteries need to be added to existing platforms to share the electrical generation burden from the gas turbine generators, so more fuel can be conserved for ship propulsion. The end solution to this problem could be much more radical and needs to be examined in great depth. Unmanned fuel tugs in concert with underwater fuel stations could service our ships, but the full implications of using such systems are far from certain. “Distributed Lethality” will prove a sea change to how naval forces employ surface assets with significant implications for tactics, command and control methods, and platform employment means. In order for it all to work, we need to be as innovative with our sustainment methods we are in all the other enabling warfare disciplines. The sooner we get started, the more seamless the final package will be. Chris O’Connor is a supply corps officer in the United States Navy and is a member of the Chief of Naval Operations Rapid Innovation Cell. The views expressed here are his own and do not represent those of the United States Department of Defense. The following is a submission from guest author James Davenport for CIMSEC’s Distributed Lethality week. Despite the recent article on Distributed Lethality1 and the paper on Offensive Sea Control2, there is a sense of hesitancy in the surface force in embracing these ideas. The hesitation is understandable. Distributed Lethality and Offensive Sea Control (henceforth referred to as Distributed Lethality for brevity) run counter to recent experience, and they appear to challenge the most successful surface program in history, Aegis, by suggesting that offensive warfare is equal to or greater in importance than the defensive operations the surface force is so well-equipped and trained to perform. Distributed Lethality cannot succeed without a change in the surface force’s culture. To enable that change in culture the surface force must understand where its bias towards the defensive originates. The surface force must understand why Distributed Lethality is sound military theory. The surface force needs to be reminded that it has embraced Distributed Lethality before to great effect. The surface force must rethink how it views survivability in an anti-access/ area denial (A2/AD) environment. Finally, the surface force must change its culture through training and repeated exposure to the concept of Distributed Lethality. With the fall of the Soviet Union, the USN’s superiority was unchallenged for more than a decade. The USN became a victim of its own success. Assured of its superiority, the Navy started reducing its offensive flexibility. The USN built thirty-four guided-missile destroyers with no over the horizon anti-ship capability at all and retired the long-range anti-ship version of the Tomahawk missile. There was no challenger to use it, or practice using it, on. The surface force’s focus was squarely on visit, board, search, and seizure and air and missile defense operations. The focus on air and missile defense operations is reinforced by the superb training on the Aegis Weapon System most Surface Warfare Officers receive at some point in their careers. 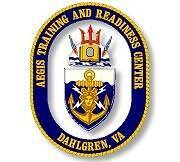 Aegis Training and Readiness Center in Dahlgren, VA is rightly regarded as a center of excellence for training. Surface Warfare Officers can receive training there three or four times through their career inculcating Surface Warfare Officers in the Aegis culture of excellence. The success of Aegis and its adaptation to the ballistic missile defense mission is a tribute to the partnership between the Navy, the Missile Defense Agency, and our industry partners. No one system has dominated the thinking of the surface force in the way Aegis has. The result of these influences is a defensive-minded surface force. Many in the surface force perceive their mission as providing defense against small surface vessels, cruise missiles, ballistic missiles, and submarines. In return, the air wing goes on the offensive against ships and aircraft, while the submarine force goes on the offense against threat submarines and ships. This mindset says in order to survive the force has to operate as a whole, while concentrating the majority of the offensive firepower in a small number of submarines and an even smaller number of aircraft carriers and their air wings. This concentration of offensive firepower limits flexibility, reducing the Navy’s ability to operate against anti-access /area denial threats. 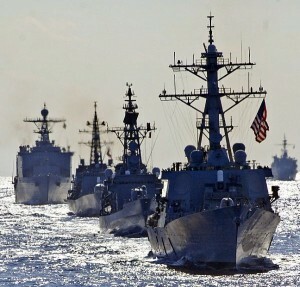 Recognizing wholesale command of the seas is impractical in the face of A2/AD threats, admirals Rowden, Gumataotao, and Fanta argue for the use of distributed lethality to take control of the seas in key areas in order to project power.1 This is certainly one significant advantage of distributed lethality and offensive sea control. It is not the only advantage, however. Corbett also recognized it would be impractical to dominate the seas completely, at all times. Corbett does identify a solution; prevent the enemy from securing or controlling the seas by “active defensive operations.”3 In Corbett’s view, sea control is not sitting off the coast of a hostile nation, asserting air, sea, and electromagnetic dominance, while launching strikes ashore. Corbett’s opinion, in more modern terminology, is that sea denial is sufficient. No matter what it is called, sea denial or sea control, the concept has value. Equipping our surface ships with more offensive capability complicates our adversaries’ planning. A distributed, lethal force must be accounted for, either by devoting resources, to defend against it, to negate it, or by amassing a robust enough force to absorb more losses and still perform their mission. Enough offensive capability may even deter our adversaries from adventurism in the first place. Not only does distributed lethality have value in disrupting and deterring potential adversaries, but it can also play a significant part in defeating them. The bulk of the USN is generally located far from potential hot spots. Only a fraction of the fleet is forward deployed. Furthermore, that fraction is spread across the globe in support of the nation’s interests. The nation’s adversaries have the advantage of being able to operate near their own shores as well as to determining when and where they will strike; in effect, negating the advantages in capability and mass the USN possesses. Thus, at the onset of hostilities the USN will be likely the inferior force, which is not necessarily the disadvantage it may seem, as long as that forward-deployed force is lethal. Clausewitz argues a force not concentrated at the same place at the same time has an advantage over a force that is concentrated. A concentrated force attacked by a smaller force will suffer disproportionate casualties and suffer disorganization from the attack, as long as the smaller force has reinforcements to press home this advantage.4 Although, the example is tactical in nature, this idea is remarkably similar to the situation the USN finds itself in today and has relevance in a modern operational context. If equipped properly with both offensive capability and mindset, a small number of forward deployed units could inflict disproportionate casualties, while being able to call upon a much larger force assembled from across the globe to administer a coup de grace against the aggressor. Captain Hughes’ makes and additional point that applies to survivability. That is offensive firepower has the advantage early in a conflict. At Jutland, in the Pacific Theater of Operations, and more recently in the Falklands, offensive weapons were more effective than their defensive counterparts, until defenses had the necessary time to adapt to the realities of those conflicts.8 The USN’s offense will be more effective than our adversary’s defense just at the time when the USN’s surface ships are most likely to encounter the enemy without the support of the larger fleet and its accompanying defensive umbrella. In light of historical examples, how the surface force currently perceives survivability must be challenged. The key enabler to Distributed Lethality is developing a training infrastructure rivaling that of Aegis while complementing, not challenging, Aegis . The new training must emphasize the advantages and how to mitigate perceived disadvantages of Distributed Lethality. In order to accomplish this, the training must address exploiting gaps in and deceiving an adversary’s scouting capability, over the horizon targeting, coordinating dispersed offensive capability in an A2/AD environment, and, of course, the proper employment of offensive weapons. Finally, Distributed Lethality training must be delivered at multiple points throughout a Surface Warfare Officer’s career to keep the officer current in the latest tactics, techniques, and procedures, and to build on the officer’s understanding of Distributed Lethality. The surface force needs to embrace the advantages of a distributed lethal force. The foremost step is equipping our force to be lethal and offensive in posture. However, weapons and sensors are not enough. The surface force must change its mindset. Only through a change of mindset, enabled by time and training, will the surface force be able to fully exploit the strengths of Distributed Lethality. LCDR James Davenport is a Surface Warfare Officer currently stations at Surface Forces Atlantic. 1 VADM Thomas Rowden, RADM Peter Gumataotao, and RADM Peter Fanta. “Distributed Lethality.” U.S. Naval Institute. January 2015. Accessed February 13, 2015. http://www.usni.org/magazines/proceedings/2015-01/distributed-lethality. 2 Clark, Bryan. “Commanding the Seas: A Plan to Reinvigorate U.S. Navy Surface Warfare.” Commanding the Seas: A Plan to Reinvigorate U.S. Navy Surface Warfare. November 17, 2014. Accessed March 23, 2015. http://csbaonline.org/publications/2014/11/commanding-the-seas-a-plan-to-reinvigorate-u-s-navy-surface-warfare/. 3 Corbett, Julian S. “Some Principles of Maritime Warfare.” Internet Archive. February 16, 2005. Accessed February 13, 2015. https://ia700506.us.archive.org/20/items/someprinciplesof15076gut/15076-h/15076-h.htm. 4 von Clausewitz, Carl. “On War.” Chapter XII Assembly in Time. Accessed February 13, 2015. http://www.clausewitz.com/readings/OnWar1873/BK3ch12.html. 5 “Navy.mil Home Page.” The US Navy Aircraft Carriers. Accessed March 23, 2015. http://www.navy.mil/navydata/ships/carriers/cv-list.asp. 6 MUIR, Malcolm. “The Zumwalt Years and Aftermath.” In Black Shoes and Blue Water, 220. Honolulu, Hawaii: University Press of the Pacific, 1996. 7 Hughes, Wayne P. “The Great Constants.” In Fleet Tactics: Theory and Practice, 183. Annapolis, Md. : Naval Institute Press, 1986. 8 Hughes, Wayne P. “The Great Constants.” In Fleet Tactics: Theory and Practice, 180-181. Annapolis, Md. : Naval Institute Press, 1986. Distributed Lethality implies a radical shift in the way we train our Sailors, deploy our forces, and equip our ships. Distributed Lethality will require a fundamental change in the way the U.S. Navy thinks about projecting firepower. For decades, the centerpiece of U.S. 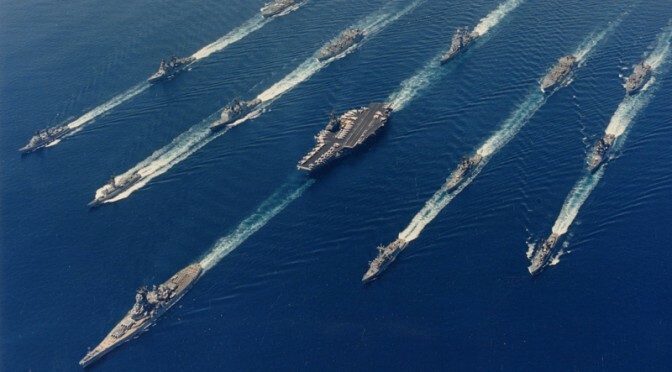 Naval operations has been the Carrier Strike Group. Some may see Distributed Lethality as the answer to China’s and other’s Anti Access Area Denial (A2AD) strategy, which is apparently designed to keep U.S. Navy aircraft carriers out of the East and South China Seas. Along the same lines, there are those outside the Surface Navy that suspect Distributed Lethality may be in part a way to wrest control from an often dominant aviation community. Whatever the case is – Distributed Lethality is here and moving forward. Lethality, new tactics or technologies that might enhance the concept, or some other facet of Distributed Lethality. How can Distributed Lethality defeat the A2AD strategy? What will Distributed Lethality Command and Control look like? How will logistics work? Should Distributed Lethality be employed only by the Surface Navy? Or should it be a Navy-wide concept of operations? Publication reviews will also be accepted. James Drennan is a Surface Warfare Officer and a Distinguished Graduate of the Naval Postgraduate School’s Systems Engineering Analysis program. Ed. note: VADM Thomas S. Rowden, USN, provided this update from San Diego after his original article received the most votes in the run up to CIMSEC’s Forum for Authors and Readers (CFAR) of those pieces our readers wanted to see discussed in person. Congratulations to everyone involved in CIMSEC, and thank you for all you have done to advance understanding and debate about Seapower, especially American Seapower. I am grateful to your readers for their interest in the piece I submitted earlier this year, “Surface Warfare: Taking the Offensive”, and I only wish my schedule had allowed me to join you for the “Forum for Authors and Readers” on February 26th [Ed note: videos online now]. Hopefully, this update will keep me in good standing among CIMSEC boosters. We in the Surface Force are embarking upon a serious intellectual deep dive into the very nature of what we do and what we CAN do, an inquiry that seeks to capitalize upon the two of the most important attributes surface forces possess—mobility and persistence. Part of this inquiry is concerned with a concept we are developing known as “Distributed Lethality”, an idea that we were still forming when I wrote the piece above and referred to it as “dispersed” lethality. You can learn more about Distributed Lethality by reading about it in the January issue of Proceedings, or by watching the second half of my Surface Navy Association 2015 speech beginning at the 25:45 mark. Properly understood, Distributed Lethality combines an opportunistic and steady increase in unit lethality over time with innovative methods of operating those units together, the goal of which is to create a new range of operational problems for potential adversaries and hold numerous and diverse targets he values at risk. As I have written, increasing unit lethality without new and innovative operating patterns sub-optimizes the investment, while new and innovative operating patterns without enhanced unit lethality assumes unacceptable risk. Both activities are required for Distributed Lethality to have impact. Working across the Surface Force—the Fleet, OPNAV, the Systems Commands, the training organizations, and ONR—we are looking at ways of getting more combat punch out of the platforms and payloads we already field by asking simple questions and then aggressively seeking answers. We are applying elements of the thinking of talented navalists like Captain Wayne Hughes and Captain Jeff Klein at the Naval Postgraduate School, CDR Phil Pournelle at OSD, and Dr. Jerry Hendrix at the Center for a New American Security to the real problems of resource constraints and evolving threats. We are taking the long view on Distributed Lethality, aiming at a horizon of 2030 for our planning purposes but with steady progress from year to year and POM to POM. I spoke at SNA of this being a “generational” effort, and I meant it. There will not be a lot of splashy, overnight successes along the way; rather, there will a series of opportunistic capability upgrades where they make the most sense at the right times. But first, we must lay the intellectual groundwork for moving in this direction, and that is what will comprise much of the work we do in 2015. A team of surface warriors across the enterprise is working hard to put meat on the bones of the articles and speeches made thus far, fleshing out the concepts and supporting concepts of Distributed Lethality, not to mention identifying the overarching concepts into which it must fold. Eventually, a small team will begin traveling to the numbered fleets and COCOMS to engage in a two-way dialogue designed to expose planners to what our thinking is, and to vest our concept development team with an updated appreciation of the operational factors most at play in the various areas of responsibility (AOR). Additionally, we are working with the Naval War College to frame appropriate war-games and analytical venues to allow us to identify near-term, high-impact lethality upgrades and to ensure that our thinking is not in violent conflict with established methods of doing business. I frame the previous sentence the way I do because I am not ignorant to the possibility that what we are suggesting with Distributed Lethality could be potentially disruptive to current thinking about large scale maritime campaigns and war-at-sea. I honestly don’t think we would be doing our jobs very well if we weren’t constantly evaluating the status quo in search of more effective and efficient methods of delivering Seapower from the Surface Force. I hope CIMSEC readers would agree. In the meantime, little victories are accumulating, and the logic behind Distributed Lethality becomes clearer. Earlier this month, Naval Air Systems Command and Raytheon conducted a test demonstration of a Tomahawk Block IV missile that received off-board guidance to intercept a moving surface target. Getting back into the over-the-horizon ASuW game is a central thrust of Distributed Lethality, and this interesting re-purposing of the Tomahawk is exactly the kind of opportunistic, straightforward capability upgrade that we seek. Think about the utility and flexibility of a Tomahawk sitting in a VLS cell that can strike fixed land-targets, moving land targets, or moving maritime targets. One missile, three very different targets. Apply that thinking across other munitions and projectiles, and we really begin to provide gritty operational problems to adversaries grown used to our defense crouch. Before I close, let me once again reinforce the centrality of high value unit defense and Strike Group operations to Surface Warfare. Nothing we do in Distributed Lethality should be seen as taking away from our historic and necessary role in enabling naval power projection by helping to protect CVN’s and ARG’s. We start from the proposition that HVU operations and defense is our main mission, and then work to create operational problems with more lethal and distributed surface forces from there. Our proposition is that the Surface Force can do more, and we’re going to take the time necessary to study and analyze that proposition in order to get it right. Thanks again for the opportunity to provide this update, and keep up the great work. CIMSEC is establishing itself as an intellectual powerhouse in maritime matters, and I am proud to play a small part.